Hit & Miss is a perfect example. Hit & Miss stars Chloë Sevigny as a transsexual contract killer who learns that she sired a child with her former lover. 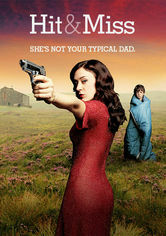 “She’s not your typical dad” is the tag line, which, together with the premise, made it sound to me like a black comedy. It isn’t. Hit & Miss is dark, moody, and deadly serious in both content and action. Sevigny takes on what in Hollywood would be called a “brave” role, but she’s never shied away from a challenge. Still, from the opening scenes of Episode One wherein we are shown without doubt or hesitation that the character of Mia is definitely a pre-op transsexual, this role is different. Mia’s complicated life becomes more complicated when she learns that Wendy, her former lover, has died of cancer, that one of Wendy’s four children was sired by Mia, and that Wendy has named Mia as legal guardian of her children. What follows is the story of this unlikely group, how they clash, how they react, and how they eventually come to terms with each other and the world around them. The scripts so far (I’m up to Episode Three), though often spare of dialogue, have strong writing and the slower, more deliberate pace that I have come to expect from modern British drama. The acting from all, including the young children, is understated, tempered, and exceptional. Halfway through the series, now, my writer-brain wants more backstory for our main character, and I don’t know if I’m going to get it or not. But backstory or no backstory, the mainline plot is intriguing enough, complicated enough, believable enough to keep me interested and happy.